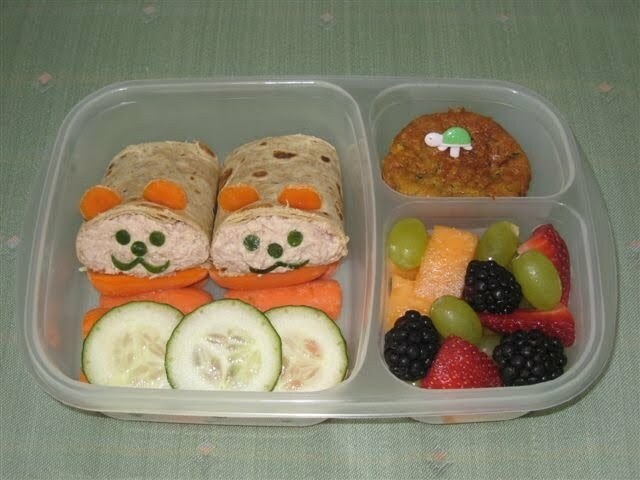 No school this week, but we had a project that needed doing, so we made lunch bentos anyhow! Kelly from EasyLunchboxes sent us a set to try out and see what we thought, then another set to give away next week. F&B decided that they like the built in separate compartments and the fact that we could split up the food a little bit more. So far, I'm enthralled that they are dishwasher safe! A lot of cute supplies from Japan aren't and I do hate doing dishes. Since we had a bit of time and our home, we decided to experiment with a few wraps. F&B had tuna salad wraps on multigrain tortillas with carrot ears and cucumber faces (much easier than I thought too!). I had a cookie cutter that had tiny circle cutouts, but I think you could use a straw. The mouths are just a heart cookie cutter used twice to get the shape. Also, don't forget, this week's giveaway runs till Sunday night! Enter here! Aww the wraps are so cute!! Just letting you know Shannon - in your honor today, purely from your inspirational photos, I bought the ingredients for our first 'lunchbox muffins' -going to make ones stuffed with chicken meatballs and veggies. Next step - pretty cut out shapes, ha ha. One thing at a time - you know I have no patience! I love the muffins right out of the oven! And seriously, somedays, the lunches are the only nice meals. I have no qualms about boring food when I'm not taking pictures of it!